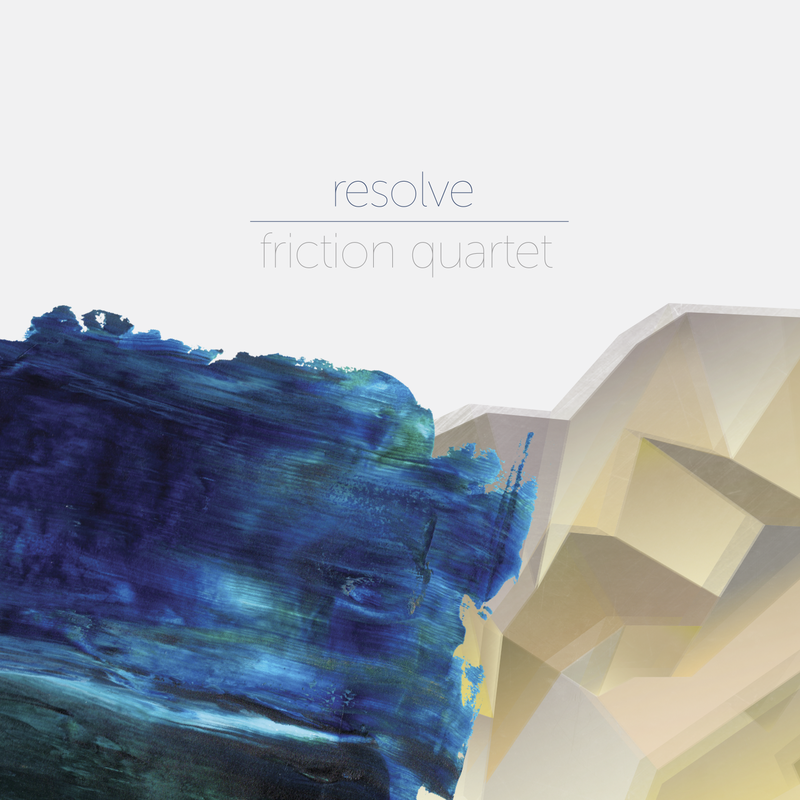 Exactly one month ago the Friction Quartet released its first album. Those who follow chamber music in the Bay Area are probably familiar with this ensemble, which consists of violinists Otis Harriel and Kevin Rogers (sharing the leader’s chair), violist Taija Warbelow, and cellist Douglas Machiz. The title of the new album is resolve and, as of this writing, it is being distributed strictly in digital form. Thus, Amazon.com has created an MP3 download Web page for it; and the album is also available through Bandcamp and iTunes. Those who have attended Friction concerts know that the group has a strong dedication to promoting new music and has reinforced that dedication with their own commissioning efforts. resolve presents performances of three compositions; and the “central position” is held by a work commissioned in 2015 for composer Roger Briggs. The name of the new piece is “Friction,” in spite of Briggs’ making his best efforts to avoid naming the music after the group. The title of the album is supposedly derived from the idea of resolution as a device in the composition of music that mediates between tension and release. From that point of view, each of the composers whose work is being presented took different approaches to what constitutes resolution over the course of his work. Haydn was composing during the eighteenth century, a time when the basic conventions of harmonic progression had emerged from prevailing practices of the preceding century. Nevertheless, Haydn was a consummate experimenter. He was always seeking out both new ways to establish tension (usually through dissonance but sometimes through rhythm) and unexpected techniques for releasing that tension to return to more familiar progressions. Hoboken III/77 was given the name “Emperor,” because its second movement was a set of variations on a hymn that Haydn had composed to serve as a “national anthem” honoring the Holy Roman Emperor. Writing variations was one of Haydn’s favorite ways to experiment; and several of the variations in Hoboken III/77 involve imaginative “warping” of “national anthem conventions,” although the solemnity of the hymn itself is never compromised. Britten’s Opus 36 was composed in 1945, a very dark time for England during World War II. Britten’s personal situation was complicated by his own commitment to pacifism. As a result, Opus 36 is very much a product of the tension in the composer’s own life. 1945 was also the year in which he composed his Opus 33 opera Peter Grimes, a dark narrative of alienation whose tensions had been ingeniously captured by Britten through harmonic progressions, unconventional rhythms, and imaginatively dark instrumentation. In many respects Opus 36 amounts to further reflections on those tensions, now distilled down to the more fundamental expressiveness of a string quartet. By the time musical practices had advanced to this decade, many composers no longer saw harmonic progression as a means of expressing tension and release. Briggs is one of those composers. His techniques take a far more fundamental approach to string quartet playing involving a richer palette of sonorities derived from extended performing techniques. What emerges in “Friction” amounts to a sustained prolongation of tension that never really resolves but, instead, is allowed to evaporate into silence. The piece lasts only a little more than five minutes, which comes off as just the right amount of time to figure out what the composer is doing and then enjoy the ride. Taking the album as a whole, Briggs’ composition can be approached as a new form of tension that departs significantly from anything one might find in Haydn’s toolbox. Indeed, Briggs’ novelty is so intense in Haydn’s wake that even the dark passages that begin the Britten quartet provide an initial sense of release. However, that sense is quickly seen as deceptive; and there is very much a sense of irony in the way in which Britten concludes the final movements with a clear sense of cadence that is far less clear when it comes to any rhetorical sense of release.